This entry was posted on Friday, October 18th, 2013 at 5:48 am and is filed under Photography. You can follow any responses to this entry through the RSS 2.0 feed. You can leave a response, or trackback from your own site. 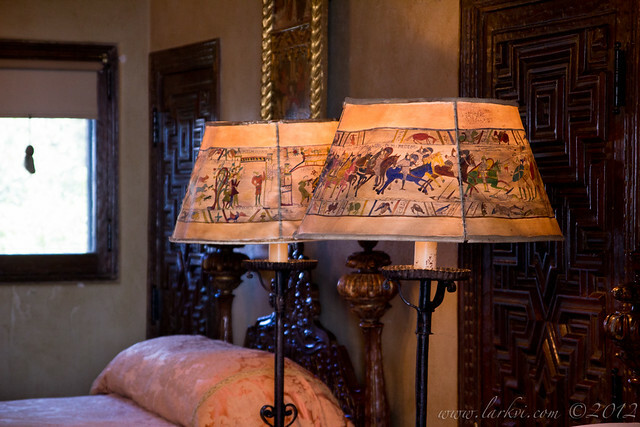 These lampshades, painted with scenes from the Bayeux Tapestry, were in one of the fine rooms reserves for single women visitors to the castle. Despite W. R. Hearst living extramaritally with his girlfriend, rather than his wife, there were apparently strict rules of decorum for other single female guests.